The feast of Palm Sunday, the day on which tradition says that Jesus rode a donkey over the Mount of Olives and into Jerusalem, has been an important Jerusalem feast at least since late antiquity. The 4th century pilgrim of Egeria, in her famous pilgrimage diary, writes of seeing “all the children in the neighborhood, even those who are too young to walk, … carried by their parents on their shoulders, all of them bearing branches, some of palms and some of olives.” Today the annual Palm Sunday walk over the Mount of Olives still attracts thousands of Christians from Jerusalem, Israel and the West Bank, Egypt, and the rest of the world. 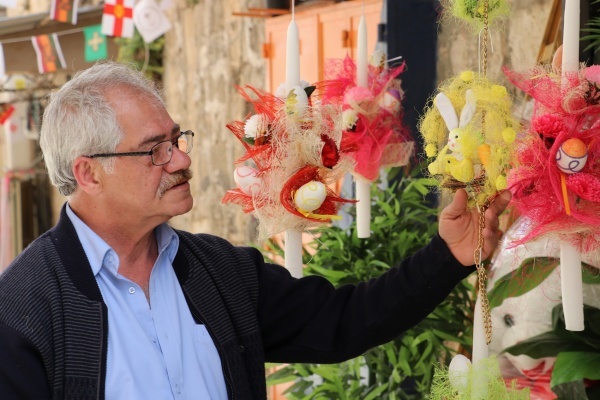 But as today local Christians only account for 2% of Jerusalem’s population, they have precious few artisans left to keep alive age old Palm Sunday traditions. 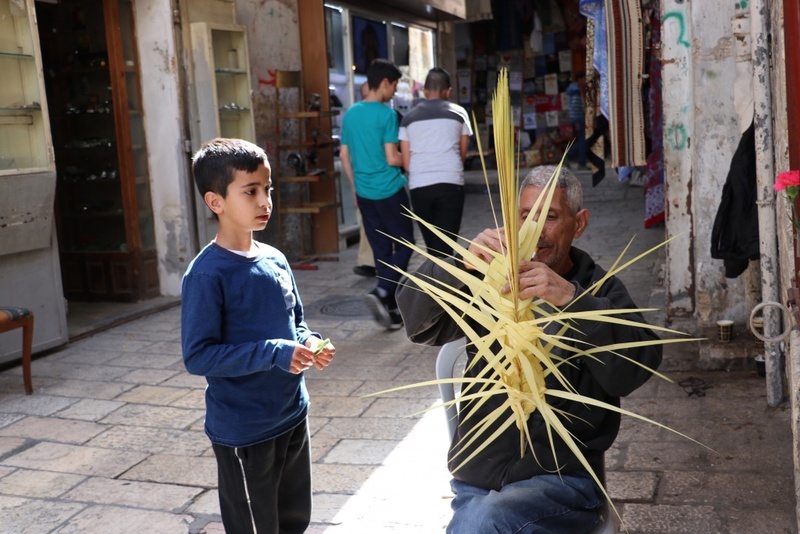 This year, as the Orthodox and Catholic Feasts coincide on the same calendar day, I visit the Christian Quarter of Jerusalem, just around the Holy Sepulchre, to speak to those local artisans who weave and decorate palm branches for the feast. 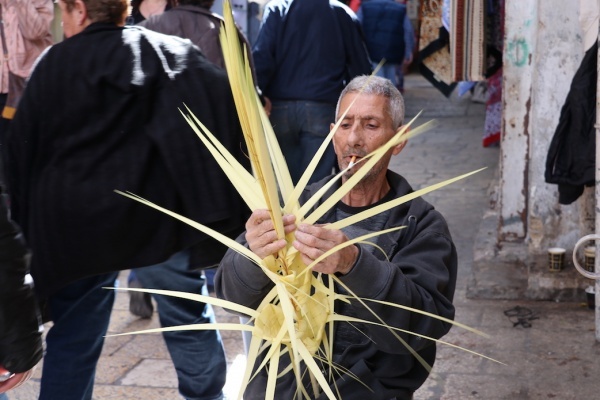 While carrying palms on Palm Sunday is a tradition carried out all over the world, local Christians in Jerusalem and the West Bank often buy intricately woven palm branches for Palm Sunday that are crafted by local artisans. 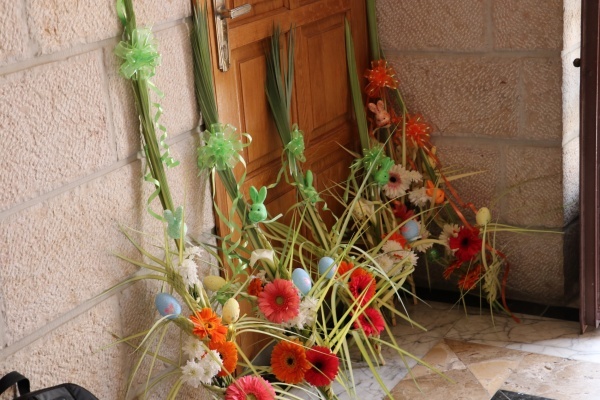 The woven palms contain special pockets meant for flowers: families will often spend some 50 shekels—almost fifteen dollars—for palms and flowers for each child. The palms are blessed during the Palm Sunday mass, and traditionally photos of the children are taken after the mass and kept as memories for a lifetime. 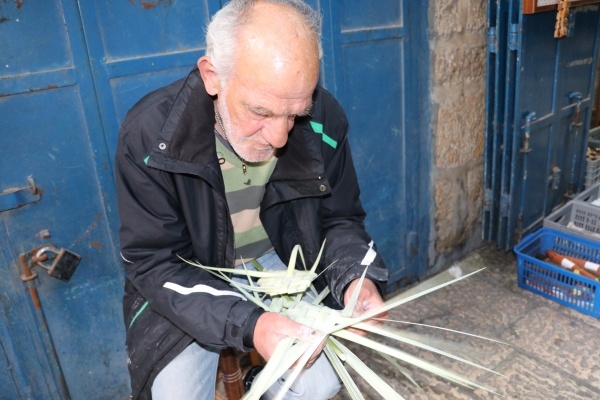 Tawfiq Samara weaves palm leaves in the Christian Quarter of Jerusalem. Samir Quttaneh sells candles he crafts by hand in the old city of Jerusalem.